Moosetookalook, Maine is the small town in the Western Maine Mountains that Liss MacCrimmon returns to when she needs to recover from an injury and reinvent herself in Kilt Dead, the first book in the series. 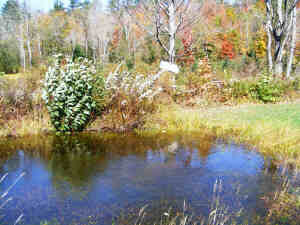 It does not really exist, although it has characteristics in common with any number of small, rural Maine communities. 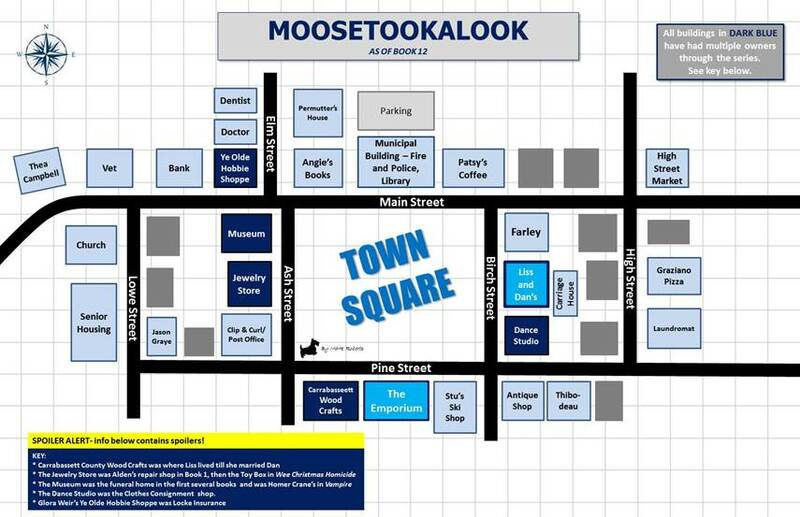 I am grateful to Mark Roberts for creating the town map above. Mark is a reader who wanted a clearer picture of where various buildings are located and contacted me to ask. As he notes, there may be a few spoilers, since several shops change hands in the course of the first eleven books, and not always because the owners chose to retire! The name Moosetookalook comes from a small pond we dug on our property to drain a swampy area. We dubbed it Moosetookalook because moose have occasionally come there to drink. It also attracts deer, ducks, frogs, and other critters. The fictional town of Moosetookalook is located the the equally fictional Carrabassett County. All of the towns in this fictional county are also fictional: Fallstown, Waycross Springs, and any others I may make up in the future. I will confess that the University of Maine at Fallstown bears a strong resemblance to the University of Maine at Farmington, where I worked as a library assistant for almost a decade, and Anisetab College, located in a neighboring county, has a few things in common with Bates College, my alma mater, but overall, the people and places in the Liss MacCrimmon series come entirely from my imagination, as do the businesses, the highland games, and Liss's dance company. The only exceptions are real places too large to ignore, such as Portland, Bangor, and their respective airports. 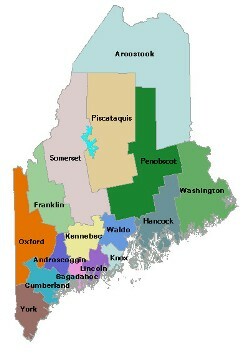 Below is a map of the real counties of Maine. To create Carrabassett County, I displaced sections of Oxford and Franklin Counties. Carrabassett County is long and narrow and extends right up to the border with Canada.